Swim Lessons & Classes Are Offered Year Round! Water Babies Fla teaches babies and kids of all ages and swimming abilities. We specialize in working with children that have aqua-phobias, children with special needs such as Autism, ADHD, ADD, Down Syndrome & children with physical disabilities. A single lesson plan or approach doesn't work for all students. Our instructors use non aggressive teaching techniques that will allow your child to become comfortable, and eventually love water. It is also crucial to let students know that you are there with them, physically and emotionally, that you are always there to keep them safe and that you understand when they are struggling to accomplish a goal. Our Students must always complete their lessons with a sense of accomplishment. We always recognize our students victories no matter how big or small. We emphasize the importance of safety rules. It generally takes about 10 lessons for a someone to learn how to swim, depending on such factors as general temperament, ability, attitude of ones parents and past experience in the water. We offer private, semi private and group swimming lessons for babies, children and adults plus aqua aerobics & fitness swimming. Our swim school runs year round currently available in the entire south Florida area, as a part of our service we are mobile and come to you or we offer lessons at a pool nearby. *Workouts in cool water are refreshing, a benefit for those prone to heat stress. Water resistance also helps to improve muscular strength & endurance. Since water resistance can be controlled or adjusted by speed or positioning, workouts can be designed to meet the needs of everyone, regardless of age and fitness level. For these lessons, parents (mom, dad, or another adult) are required to be present in the water and will receive instruction on techniques that teach their baby to hold their breath under water,learning to climb out of the pool safely, feel comfortable in the water, learn to float on their backs and engaging in their new environment. This teaching format is both a great bonding experience for families and a helpful method in teaching children to become swimmers at an early age. Neurological research links movement to learning and memory. Active movement is scientifically linked to intellectual development. Babies are born with most of their neurons but they have few interconnections (synapses) between neurons. As a baby moves and interacts with his world, neurons are stimulated through movement and develop more synapses. The more interconnections, the more capable the child is of learning. *Increased development: Studies at the German Sports College in Cologne have shown that early childhood swim lessons accelerated physical, intellectual and emotional development (German Sports College Cologne. 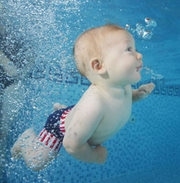 Baby Swimming: Advance Independence and Development of Intelligence. World Aquatic Babies and Children Network). *Enforcing all aquatic rules & regulations, also educating patrons about them. *Administering First Aid & CPR or using an AED in an emergency and if trained administer oxygen when needed. Prenatal Exercise Classes blend aerobics, dance, Pilates, swimming, relaxation and yoga, in the comfort of water and heated pool, to promote wellness during pregnancy and facilitate the childbirth experience. Swimming is an enjoyable and safe way to stay fit while you’re pregnant. It improves your circulation, increases muscle tone and strength, and builds stamina. Your bump will also be supported and you'll feel almost weightless. Exercising in water also reduces your risk of injury and makes it less likely that you'll have sore muscles afterwards. Swimming can also help to ease pregnancy niggles, such as backache and swelling in your hands and feet. It may also help to relieve varicose veins and restless legs. Share the magic of water by feeling weightless! · Experience the balance of relaxation and exercise - a magnificent way to unwind and stay healthy during your pregnancy. · The classes take a holistic approach to a mothers physical and mental health, combining relaxation with cardiovascular exercises to help the body get ready for labor. · Classes take place in the calming, warm comforts of our heated pools, which is one of the safest ways to exercise during pregnancy. · There's a science behind it too! Exercise and relaxation releases your body’s natural happy hormones, endorphins, which suppress pain and help you and your baby feel serene. This is not only useful later in your pregnancy, but also really essential during and after labor. · And once your baby is born, the familiar sound of the water means they’ll be comfortable when you take them swimming too! · You can also use these work out techniques to gently get back into shape post-pregnancy! Classes are available throughout the year, our swim school welcomes small groups of expecting mothers every week! Our instructors are nurturing, patient, and motivating.